Tag along for our first day of day tripping outside of Belfast in Northern Ireland. We've come from Seattle to road trip around Northern Ireland and the Republic of Ireland and today we're stopping at Carrick-A-Rede and Kinbane Castle! One of the things we love about Belfast is that it's so easy to stay in the city and day trip out to some phenomenal Northern Ireland natural beauty. 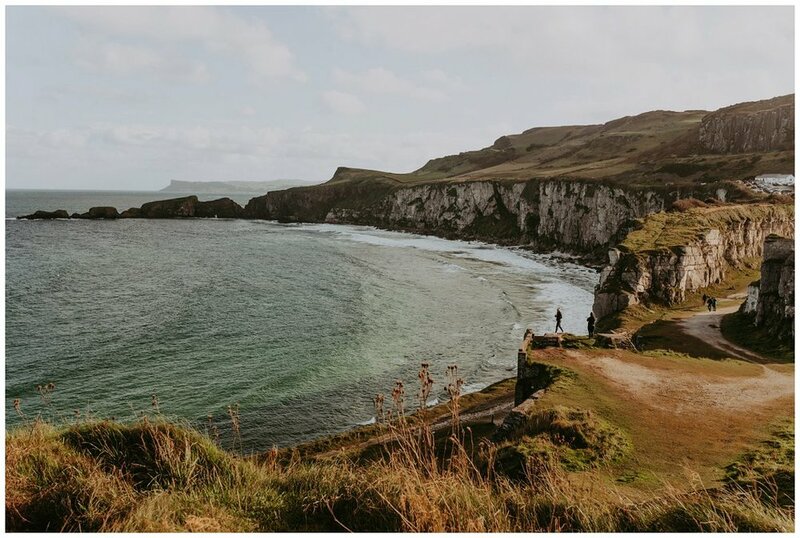 From Giants Causeway to Carrick-A-Rede to Bushmills Whiskey Distillery, Dunluce Castle and soooo many more, there are tons of jaw dropping attractions around the area. At just under an hour and a half, our first stop of the day was Carrick-A-Rede Rope Bridge. If you've been following my Ireland stories or personally know me, you know that the last time we were in Ireland I was insanely sick with a six week viral infection. Possibly one of the worst days of sickness was during our visit to the Giants Causeway and Carrick-A-Rede. Feeling much better this time around, I was determined to cross the bridge. Hanging almost 100 feet above water, the Carrick-A-Rede Rope Bridge links the island of Carrickarede and is thought to have been crossed by salmon fishers for over 350 years. While the new bridge is as new as 2008, in 2017 before our trip, a good for nothing vandalist tried to cut the bridge, resulting in closure of the bridge obviously for safety concerns. When we saw the news, I was so infuriated that 1. someone would do that, and 2. I hadn't been able to cross it and they weren't sure of the reopening at the time, if ever. Therefore, we made it a point to add it back to our trip list to conquer it once and for all. Welp.. I wish I could tell you a happy story about how I conquered the bridge and checked it off my bucket list... but the one thing about traveling folks- make sure you get to popular destinations first thing in the morning, possibly even before opening. Upon reaching the line and hoping it'd move along and work out, we ultimately decided that there were so many other amazing things to see for free and didn't want to spend our time in Ireland waiting in half day long (or more) lines. The one thing about Carrick-A-Rede is because it's so small, they only allow so many people over the bridge at a time and you're only allowed to spend so long on the island. While that's fine and dandy, the process still can be grueling for the wait and you just have to determine whether the wait is worth it to you. Since we'd already been to Carrick-A-Rede, we decided to do some exploring on a side trail heading away from the parking lot. Despite the BONE CHILLING wind, the views were drool worthy. Pro Tip: If you're visiting any part of the coastline in Ireland, definitely bring a beanie or snug hat as the wind stings your ears and any attempt to tame longer hair is feeble. As you can see in the fifth picture down, my hair was just constantly standing on end and I was pretty over it after a couple of minutes. There is a small snack bar serving soup at Carrick-A-Rede, but fighting the crowd to see the menu proved pointless (can't we all just kindly wait our turn, btw!?). We were grateful for the break from rude tourists anyways, and drove into Ballintoy for a bite. We chose to eat at Fullerton Arms after seeing some really good reviews. In my opinion, the food was just okay, but my husband loved the fish and chips. The bartenders were friendly, however, and we love the small town pub culture where fires crackle in stone hearths and an Irish Wolfhound was fed chips and given pats. Fullerton Arms Restaurant is hidden behind door number 6 in the Game of Thrones series themed door carved from a tree that fell in the Dark Hedges. If you're a GOT buff or fan, it is cool to see, however, please be courteous of the people actually trying to get in and out of the restaurant. I snapped a quick picture and moved on, but we had a hard time pressing past the tourists off of a tour bus to dine. In all honesty, I'm conflicted sharing or speaking about Kinbane. It's truly a hidden gem and while I'd love for others to discover it, part of the reason we loved it so much was the lack of tourists and epic awe-ness that the solidarity provided. If I were to visit Kinbane again (which I absolutely would) I would pack a lunch and picnic down there for the majority of the day. The lapping of the sea against the rocks below the castle, the stream of water cascading off of the lush green cliff and the whisper of grasses around the castle was bliss. The walk down and up from the castle isn't extremely difficult, but still proves quite a trek. We were on a bit of a time crunch and spent only about 2 hours at Kinbane, but I'd rather have spent at least 4 just soaking up the beauty. This is also absolutely a place to bring warm clothes. I happened to remember that I had a little knit ear warmer band in the car and that at least saved me from withering away from chill. Kinbane was a good reminder that although you want to see so many things when you're traveling, if you find a place that sings to your heart, take the time to revel in it. Even if it means coming back a second day or pushing back plans, part of traveling is experiencing the world and letting it take it's hold on you. With wind chilled cheeks and tangled hair, we drove in stunning golden light back to Belfast for another night. ...Stay tuned for more blogs about our trip from the Emerald City to the Emerald Isle- Road trips around Northern Ireland and the Republic of Ireland!